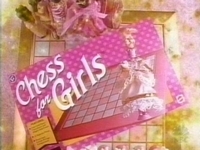 Saturday Night Live’s fake commercial, “Chess for Girls” [transcript], was hilarious in 1997–but today, it strikes awfully close to home. An ultra-pink chess set that’s “not too hard, just pretty and fun”–with prancing ponies and a long-haired queen in a gown? Wow. Who knew SNL could see the future of children’s popular culture? Right now, everyone is talking about gender divisions in the toy aisles. Boys toys swim in a sea of blue and black, while girls’ toys look like victims of a catastrophic Pepto-Bismol spill. This is a big enough problem that about a month ago, Hamleys toy store in London made news by desegregating children’s toys, grouping them by interest instead of gender. It wouldn’t have been newsworthy if the typical toy store layout wasn’t such a problem. As you’ve likely heard, LEGO one-upped the stakes recently by creating a reductive and offensive girls’ line of LEGOS. If you think about it, the concept of LEGOS for girls practically plagiarizes SNL’s Chess for Girls. Like chess, LEGOS are enjoyable to both boys and girls. But making a new LEGO line that is pink, beauty-centric, and not too hard? Perfect! No wonder parents and critics are upset. In fact, it seems a movement is building, buttressed by a national dialogue about unnecessarily heightened gender divisions in children’s popular culture. SPARK mailed LEGO more than 48,000 signatures protesting the new line yesterday. The numbers speak volumes. But how did we get here? How did gender divisions become quite so divisive? There are lots of ways to explain this history. But in my opinion, Disney–one of the major producers and arbiters of children’s culture–plays a central role in it. In 1999, a Disney exec realized that by grouping Disney’s Princesses together, they might be worth more than the sum of their parts. This marketing insight that has brought Disney billions in revenue. Other companies like Mattel moved quickly to cash in on the trend, fueling the princess craze. If there’s a princess version of nearly everything, and “princess” is a category that excludes boys, then gender divisions in children’s popular culture can only be heightened. Superheroes are for everyone–even if they’re “for” boys, girls enjoy them, too–but princesses are aspirational. Only girls can become princesses, so princess culture is only for the girls. And this means that the Disney Store now gives about 2/3 of its floor space exclusively to girls, if the Boston-area Disney Store I visited with my family last weekend is the norm: Cars and Toy Story products largely filled the left-hand side of the store, while the center and right featured princess and nothing but princess. When I was a kid, Disney was about Mickey and Donald and Goofy and Pluto. Oh, and Minnie and Daisy, too. These were characters all kids could enjoy. The recent devolution in children’s culture–from boys and girls having at least SOME shared interests, to such a divisive schism–is troubling. In fact, when I assign my 19-year-old media studies students to analyze what’s happening in their local toy aisle, even they are surprised: They haven’t shopped in toy aisles in nearly a decade, and though they remember some gender divisions (boys’ aisles and girls’ aisles have been around for ages), they often don’t remember those divisions being quite so complete. The only way our current situation will change is if we fight back. And that’s why I created a petition about Hasbro’s talking Princess Celestia toy. A television show has finally presented a princess character that appeals to boys and girls alike–because she’s a leader, not a beauty object. If you agree that children need more characters like these, and that toys shouldn’t reduce such characters to princess stereotypes, won’t you please sign it? Readers: What are your thoughts on the gendering of children’s popular culture? How have you seen it shift over time? Do you agree that the Disney Princess phenomenon has a lot to do with the current situation? P.S. I’m excited to announce that my new book was released this week! If you check it out, please let me know what you think. Great post! What a difference it would make if boys and girls weren’t so polarized by the toy industry. There are so many valuable skills kids can develop from playing TOGETHER. Kids need a wide range of diverse experiences in order to grow into productive, capable and happy adults – adults who communicate with one another, solve problems together, work together, have families together etc. Encouraging kids to play together is a fantastic way to lay the foundation for positive relationships thoughout a lifetime. If you don’t like it, don’t buy it. Done. No need to boycott, picket, write your congressman, etc. Just don’t buy it. That is the only thing that a corporation is going to care about.